I own a Minelab GP3500 and usually run DD coils. 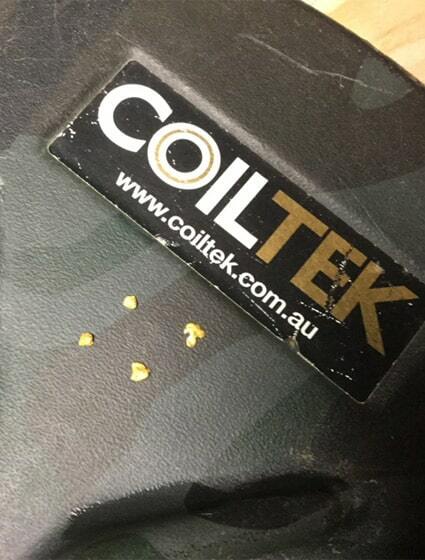 One day, when at a Minelab dealers shop in Ballarat, I was given the opportunity of taking the 11in Coiltek Elite for a test run. Another prospector was standing beside me and said “mate, those coils are too sensitive for your old GP3500, you will get nothing but ground noise” I was undeterred, I had heard how good these coils were, and Coiltek would not say they would suit a GP model just to get sales, so I was in I headed off to a patch that I had got some nuggets from and thought I had cleaned out. Within minutes of swinging this coil, I started picking up more gold. I was shocked! How could I have missed these such clear signals? AND... The coil ran like a dream on my “old machine”. The nuggets I was finding were all sub-grammers that the DD coils I ran just did not hear. I’m talking .1 and .2 bits! Ha, he was wrong! It was then, that I decided I had to rake this area and see what was really there. Bingo…more gold! But along with the gold were many bits of degraded iron, which I dutifully cleaned out, as I knew the effort was worth it. As I continued to clean up the ground, more and more gold was found. I then swung over an exposed lump of quarts and the coil screamed at me. Ah more junk I thought. So I moved the rock out of the way and swung again, but the signal was gone. I then put the rock over the coil and it screamed again. When I turned the rock around, I nearly fell over backwards and gasped in excitement, I could see a good amount of yellow sticking out of the side. I believe this was my first specimen gold! When I got home, I cracked the quartz open and discovered this beautiful piece of gold that was hidden within. It is also still my biggest nugget to date. I proudly keep this in a display case and show everyone that comes to visit. The second photo is a collection of a few more bits found at the same patch. I continued to get many more bits from this patch after I raked and cleaned it up and dug it over. The 11in Elite is just so sensitive and gives such a crisp sound. I rarely take it off. To take it off when it has done me so well, just seems like madness. I now constantly rave about and recommend this coil to anyone who is looking to expand their prospecting arsenal. You really just can’t go wrong with a Coiltek Elite! I hope soon to have opportunities to run some of the bigger Coiltek Elite range…who knows what else I will find at my favourite patch!